SIDDHIPUR, 23 August 2010 (IRIN) – In the fight against disease and child mortality, Nepal has been using some unusual tactics to get people to stop defecating in the open. Children blow whistles at offenders and post name-and-shame flags in fresh, stinking piles; NGOs help communities turn their waste into “humanure” for crops; and one women’s group “calculated” how much waste tainted the food supply. “We told the community, `If we don’t make proper toilets, it’s like we’re all eating our faeces,’” said Saraswati Maharjam, a member of the sanitation and hygiene education team in Siddhipur village on the outskirts of Kathmandu. “In one year, we’re eating 2kg of faeces, and this is if you live far from the public toilet. If you’re near the public toilet, it’s even more,” Maharjam said, referring to the rough estimate her women’s group came up with to scare neighbours into building toilets. 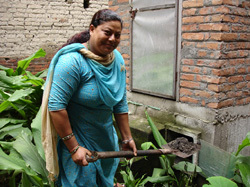 Open defecation is a major problem in Nepal. According to the UN Children’s Fund (UNICEF), only about 46 percent of Nepalese have latrines in their homes – and in the least developed districts in the west, that figure drops to 25 percent. This entry was posted in Progress on Sanitation, Sanitary Facilities, South Asia and tagged Nepal, open defecation-free villages. Bookmark the permalink.